Back in the 1960s, when I was just a young lad and when there were only three major television stations to contend with, The New York Times used to make pithy commentaries, in their TV section, regarding films that were to be aired that day. I have never forgotten the terse words that the paper issued for the 1957 cult item From Hell It Came. In one of the most succinct pans ever written, the editors simply wrote: “Back send it.” Well, I have waited years to find out if this hilarious put-down was justified or not, and now that I have finally succeeded in catching up with this one-of-a-kind cult item, have to say that I feel the Times people may have been a bit too harsh in their assessment. Sure, the film is campy, and of course, its central conceit is patently ridiculous, but does the film give the viewer that one necessary ingredient — namely, fun — that all good movies should provide? Oh, yes! As the film opens, the viewer sees Kimo (handsome Gregg Palmer, the first in a long list of “no-name” actors here), the son of the former chief of this nameless South Pacific island, staked out, face up, on the ground. Wrongly accused of the murder of his old man by the real perpetrators, the new chief Maranka (Baynes Barron) and the evil witch doctor Tano (Robert Swan), and betrayed by his faithless wife Korey (Suzanne Ridgeway), Kimo is summarily put to death by having a dagger hammered into his heart, but not before he utters the words “I will come back from the grave to revenge myself … I shall come back from hell and make you pay for your crimes…” Kimo is then buried in a hollow tree trunk and forgotten. 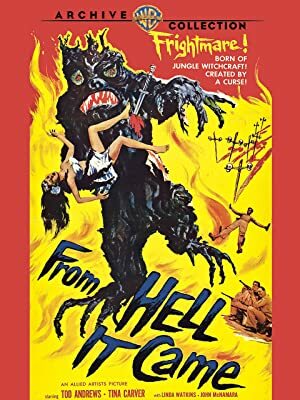 Soon after, the viewer makes the acquaintance of a group of American scientists who are also on the island, studying the radioactive effects from a distant nuclear blast. One of the scientists, Dr. Bill Arnold (Tod Andrews, the closest thing this film has to a well-known actor), is soon distracted by the arrival of the lady scientist whom he has long been pining for, Dr. Terry Mason (Tina Carver), and the team is later startled to find that a fully grown tree — with a grimacing expression on its trunk, and what look like eyes, to boot — has begun to grow out of Kimo’s grave! The scientists extirpate the bizarre arboreal growth and bring it back to the lab, where they are stunned to find that the growth is exhibiting a heartbeat! Terry injects it with one of her serums, causing the tree to come alive, escape from the lab, and perambulate (!) over to the native village, to begin its promise of vengeance. Korey is the first to go, after the tree — which the natives call Tabanga — scoops her up and chucks her into the local quicksand pool. Can the new native chief and the scheming witch doctor be far behind? The picture also showcases one of the lamest, most unintentionally hilarious catfights ever put on film — that between Korey and Maranka’s current galpal, Naomi. And as for Tabanga itself, it is a rather pleasing, if ludicrous, creation; another memorable product from Paul Blaisell, who would also be responsible for the monsters in Day the World Ended, It Conquered the World, The She-Creature and Invasion of the Saucer Men. The tree monster here is actually a more intimidating proposition than the apple-throwing ones to be found in The Wizard of Oz, which looked menacing but were still stuck in one place, as well as the one to be found in the 1958 British horror offering The Woman Eater, which devoured its victims whole but was also immobile. When I was little I came across one scene from this movie; it’s when Kimo/Tabanga is carrying the screaming Korey to the quicksand pool and throwing her in. That’s all I saw. It gave me nightmares! And it completely convinced me about ambulatory-tree-monsters. (To be fair, I was about eight.) It took the Ents, five years later, to rehabilitate walking trees for me. And his actions were rooted in revenge.